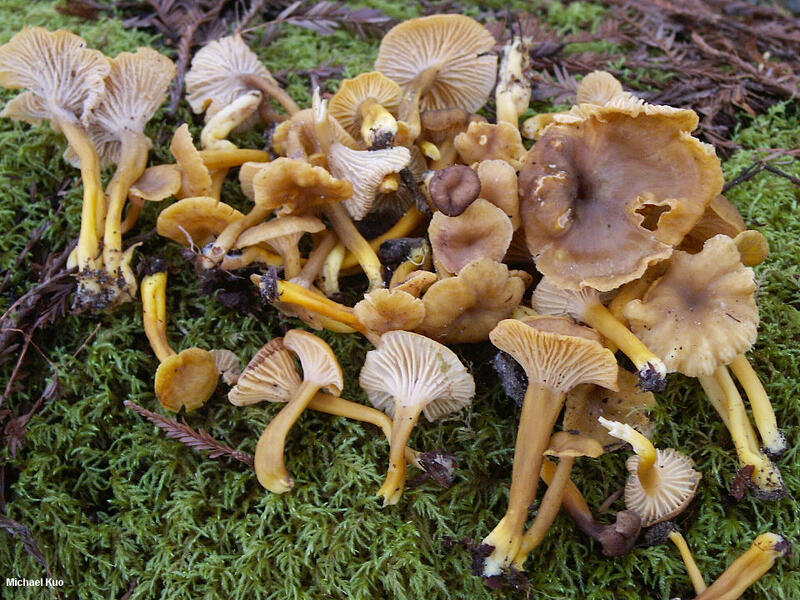 DNA results from several studies support the idea that this West-Coast version of Craterellus tubaeformis is genetically distinct, and merits status as a separate species (see the extended discussion on the linked page for details). Like the eastern North American and European species, the West-Coast "tubie" features a yellow stem with a waxy surface, a brown cap, and well developed false gills that are often grayish at maturity. In fact it is not clear at the moment whether there are any morphological features that actually serve to separate the West-Coast species--but a careful study of many well-documented collections may be able to find something some day. 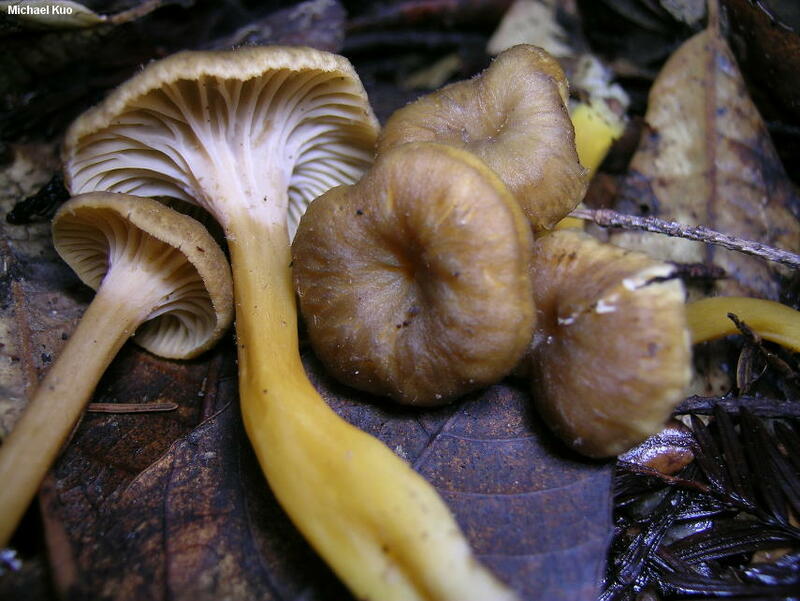 The name "Craterellus neotubaeformis" was applied as a provisional name by Pilz and collaborators (2003) to the species discussed here, but the name has not been validly published. Ecology: Mycorrhizal with conifers (including western hemlock, Douglas-fir, and Sitka spruce); growing gregariously or in loose clusters; usually growing from well-decayed woody debris (88% of the time, according to a 2004 study by Trappe); winter and spring; northern California to Alaska. The illustrated and described collections are from northern California. Cap: 2-5 cm wide; more or less convex at first; soon becoming vase-shaped and eventually becoming perforated in the center; with a wavy and irregular margin when mature; bald; sticky or waxy when fresh; dark yellowish brown, fading to dull yellowish brown or grayish brown with age; colors sometimes faintly streaked in radial patterns. Undersurface: Running down the stem; when young with ridges and folds; with age developing well-developed false gills that fork frequently and have cross-veins; yellowish to grayish or brownish. Stem: 3-8 cm high; 4-9 mm thick; more or less equal; becoming hollow; bald, with a waxy feel; usually bright yellow when young, becoming dull yellow to brownish; basal mycelium whitish. Flesh: Insubstantial; yellowish to whitish. Odor and Taste: Taste mild; odor not distinctive, or slightly fragrant. Spore Print: White to yellowish. Microscopic Features: Spores 8-12 x 6-10 µ broadly ellipsoid or, occasionally, subglobose; smooth; hyaline in KOH; contents homogeneous and minutely granular. Basidia 65-75 µ long; 4-sterigmate. 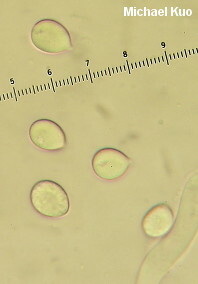 Elements of upper surface cylindric; septate; hyaline to brownish; 5-10 µ wide; clamped. REFERENCES: (Smith & Morse, 1947; Thiers, 1985; Arora, 1986; Dahlman et al., 2000; Pilz et al., 2003; Trappe, 2004; Trudell & Ammirati, 2009; Guo-ying et al., 2011.) Herb. Kuo 02200305.